Interested in learning more about using C-SPAN’s Classroom Deliberations in your class? Then you’re in luck. I’m presenting a session on C-SPAN and Classroom Deliberations at the NJEA Convention this year. This is the third time we’ve offered this PD workshop at the convention, and the participants always seem to enjoy it. What Are C-SPAN Classroom Deliberations Lessons? C-SPAN Classroom Deliberations are in depth lessons and resource sets that scaffold the teaching of current, controversial issues. C-SPAN produces about a half dozen of these lessons every year. Recent topics include whether hate speech should be protected by the first amendment, whether the United States should accept refugees, and whether Congress should raise the gas tax. They always target issues that are part of the national political conversation at the time, and some are more evergreen than others. Each lesson contains a set of videos from the C-SPAN video archive arguing for and against the question, a set of background videos, a list of vocabulary words, some background articles, and note-taking tools. This is a framework for you to develop a specific lesson for your class that allows students to engage with the deliberations question. You can read more about C-SPAN Classroom Deliberations in this post from last week. What Can I Expect at the C-SPAN Classroom Deliberations Workshop? I could spend a whole day walking you through what C-SPAN’s Education Department has to offer, but workshops at the NJEA convention are approximately 90 minutes. So I’ve gotta narrow things down a bit. Typically, the format is as follows: a) a brief introduction and overview of C-SPAN, b) an explanation and preview of what Classroom Deliberations are, and c) modeling of an abbreviated version of an actual Classroom Deliberations lesson. You’ll learn about all the things C-SPAN offers for educators, and you’ll have an opportunity to experience a Deliberations lessons as your students would. You’ll also get some swag. 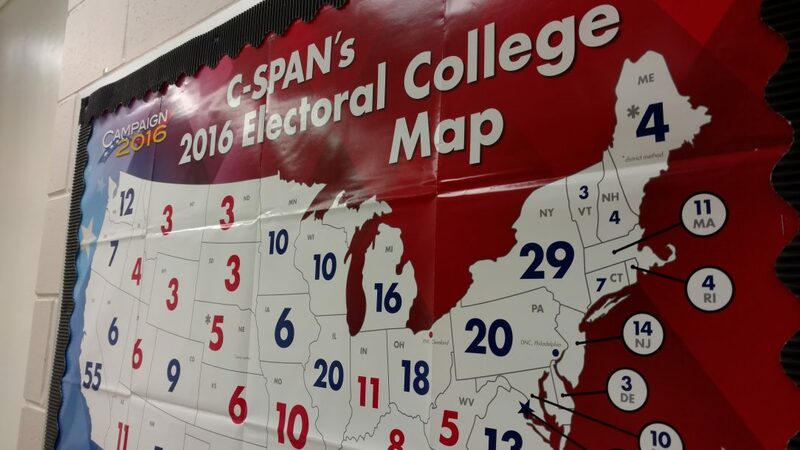 After every Presidential election, C-SPAN Classroom produces an Electoral College map. This map shows the election results, the number of electoral college votes per state, and a history of other election results. It’s a great tool to hang up in your classroom. I have a limited supply of these, and I’ll be handing them out on a first come first serve to the participants in the session. I’ve got some other stuff, too, so you shouldn’t leave empty handed. 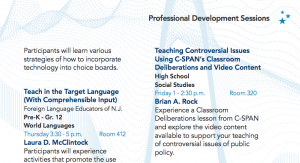 When and Where Is the C-SPAN Classroom Deliberations Workshop? My session is being offered on Friday, November 10. The session is from 1:00pm to 2:30pm. It’s in Room 320 at the Atlantic City Convention Center. This workshop is part of the NJEA Convention taking place in Atlantic City on November 9 and 10. The workshop is free and open to all members, but it is only available to NJEA members. For more details on the convention, including hotel availability, check out the convention website here: NJEA Convention. There are tons of other workshops available, and there’s a lot of options for entertainment and socializing after hours. So I hope to see you there in a few weeks!